The Winnipeg Jets, in conjunction with the National Hockey League, today announced that forward Kyle Connor has been named the NHL’s First Star of the Week for the week ending March 24/19. Connor, 22, opened the week with a goal and an assist in Winnipeg’s 3-2 win over Los Angeles on Monday. On Wednesday, the product of Shelby Township, Mich. had another two-point effort (1G, 1A) in the Jets’ 3-0 victory over the Anaheim Ducks. 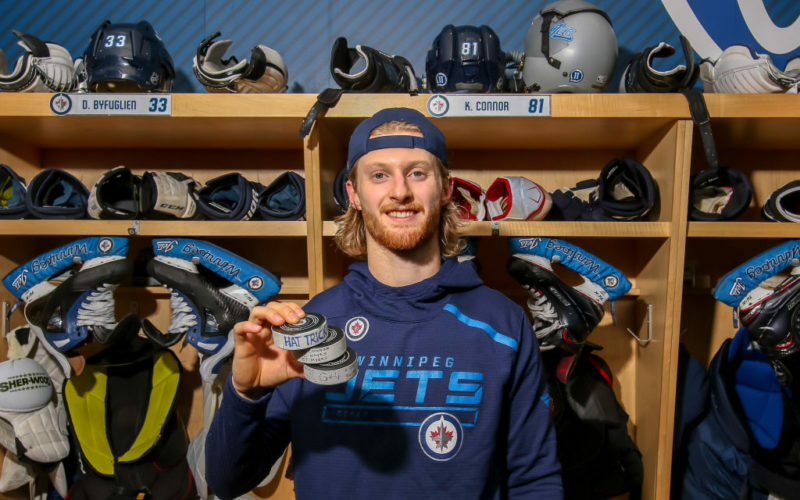 After he was held off the scoresheet on Thursday at Vegas, Connor recorded his first career hat trick and added an assist in Winnipeg’s 5-0 win over the Nashville Predators on Saturday night. His third goal against the Predators was his 32nd of the season to set a new career high. Connor led the NHL with five goals and was tied for top spot with eight points last week. On the season, Connor has set new career highs for points (61), goals (32), and assists (29) in 75 games. He is the fifth player in franchise history to record multiple 30-goal seasons after tallying 31 in last year’s rookie campaign and he’s just the second player to do so in his first two full seasons, joining Patrik Laine. This is the first time this season and the second time in his career that Connor has been selected in the NHL’s Three Stars of the Week. He is the eighth Jets player to be selected in 2018-19 after Winnipeg had eight appearances in the Three Stars of the Week last season. Connor along with Blake Wheeler (March 4 – Second Star and Nov. 12 – Second Star), Jack Roslovic (Feb. 4 – First Star), Mark Scheifele (Dec. 17 – Second Star, Dec. 3 – First Star, and Oct. 29 – Second Star), and Patrik Laine (Nov. 26 – First Star) are members of the Jets that have earned NHL Three Stars of the Week honours this season.